Home » Latest news » Introducing the Ardgowan Hospice Superstore! We can finally let the cat out of the bag! We’re thrilled to unveil the latest member of the Ardgowan Hospice retail family, the Ardgowan Hospice Superstore. 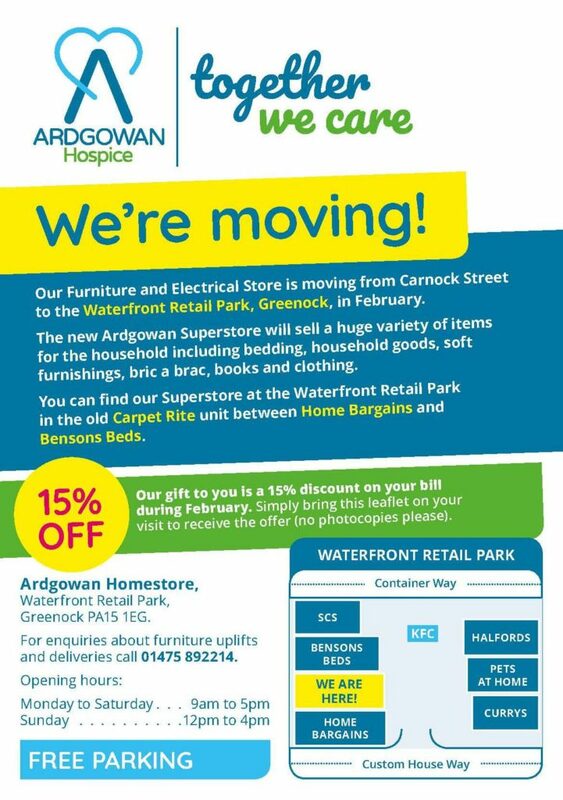 Our Carnock Street Furniture & Electrical Store is moving into the former Carpetright unit within the Waterfront Retail Park. The Grand Opening takes place Monday, 4th February at 10am. As part of the move and the name change, there will also be a stock change. Along with furniture, white goods, electricals and media. We’ll now be selling clothing, jewelry and much more. We’re so excited to show you around our new location with our old, familiar team. We’ve also picked up some new volunteers along the way so keep an eye out for some new faces!